To all of our Muslim students, staff and faculty at Webster University, we wish you a fulfilling and meaningful Ramadan season. We wanted to draw your attention to a few events and points of interest surrounding the celebration of Ramadan on the St. Louis campus. 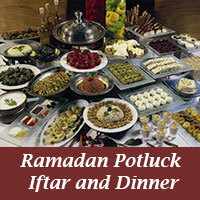 There is also an extensive website with information about Ramadan and the Webster community here. Friday, May 18, 7-10 p.m. The 9th annual Ramadan Iftar/Dinner will be held in Sunnen Lounge on Friday, May 18, from 7-10 p.m. (Iftar starts at 8:10 p.m., Isha at 9:38 p.m.). Everyone is welcome. Space is limited to 100 guests. Click here to RSVP. Please contact us if you are interested in preparing and sharing with us a traditional dish from your country. There are many ways to contribute to the potluck, even if you do not cook. Please visit our RSVP form for a list of ways you can contribute. A special note to professors with night classes: Ramadan 2018 began in the evening of May 15, and ends the evening of June 14. If you have students who are observing Ramadan, please consider the timing of your breaks during the evening classes. Students are able to break their fast at sundown, so allowing them to quietly step out to have a drink or bite to eat — or simply scheduling your break close to sundown — would be very helpful to them.